Internet Explorer’s Favorites Center is more than just a list of links. If you how, you can turn the Favorites Center into a dynamic tool that can improve your efficiency. 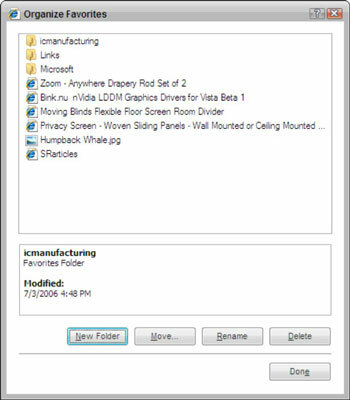 The Favorites Center includes three separate components: the Windows Vista Favorites list, the History list, and the RSS feeds list. To open the Favorites Center, open Internet Explorer. Then click the Favorites button on the toolbar (the yellow star on the far left). Once the Favorites Center opens, click the Pin the Favorites Center button (in the upper-right corner) to keep the Favorites Center open. Notice that the Favorites Center is separated into three tabs, one for each tool. The Favorites list is a great way to keep links to your favorite Web sites and folder locations in one safe place. However, the Favorites list can quickly become a long list of links that are time consuming and difficult to search through. To keep the Favorites list efficient, be sure to organize the links into folders that group similar types of links. To organize the Favorites, click the down arrow next to the Add to Favorites button, and then choose Organize Favorites. In the dialog box that opens, click a link and then click the New Folder, Move, Rename, or Delete buttons to place each link into a group folder. Alternatively, you can click a link and just drag it to a folder. You can also organize your favorites by right clicking any favorite site listed in the Favorite Center pane and then choosing Create New Folder, Delete, Rename, or Sort by Name from the shortcut menu. You can also place favorites directly in the folders where they belong from the beginning. When you find a site you like, click Add to Favorites. In the dialog box that opens, select the appropriate folder in the Create In drop-down list. If you don’t already have a good folder for the link, you can choose Create New to add one. RSS feeds (Really Simple Syndication feeds) are automatically updated content that frequently changes. 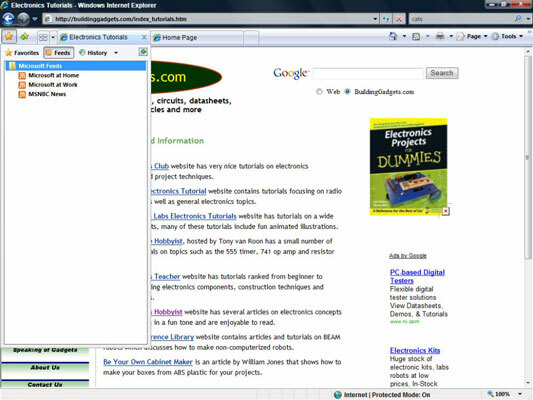 You can view new feeds by clicking the View Feeds on This Page button on the Internet Explorer toolbar. If this button is grayed out, then there are no RSS feeds on the current page. 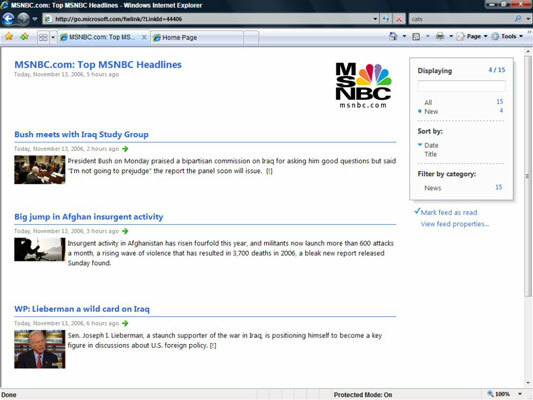 Internet Explorer keeps track of the feeds that you’ve viewed on the RSS tab of the Favorites Center. To view the latest on any of the feeds you’ve viewed before, just click the link and the Internet Explorer RSS feed reader will display the feed again. You can use the History tab to retrace your steps. 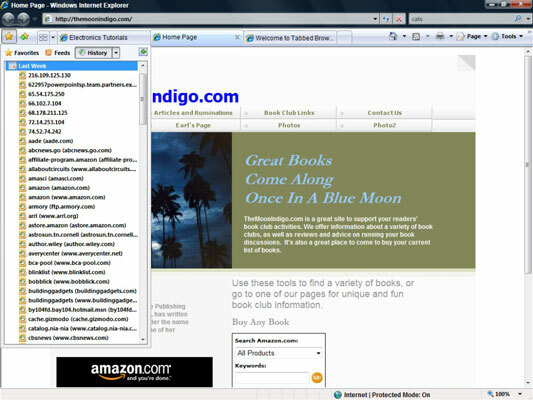 Internet Explorer automatically keeps a record of all the sites you visit and lets you organize and search them. To revisit a Web site, just click on the site in the History list. You can sort your browsing history by Date (sorted by the last date the site was visited), by Site (alphabetical), by Most Visited, and by Order Visited Today. If you need to find a specific site, try searching the History list. Click the History tab, and then choose Search History on the drop-down menu. In the search box that appears, enter a key term to look for a specific site in your history.